A guide for grown ups wanting to take the trip of a lifetime, containing information on specialist schemes and opportunities for professionals and mature travellers. Covers everything from what to pack to paying the mortgage when away, as well as advice from adult gappers who have been there and done it. There has never been a better time to take a gap year or career break, the recent economic climate has seen a rise in mature gappers, seizing their opportunity to see the world with wiser eyes. 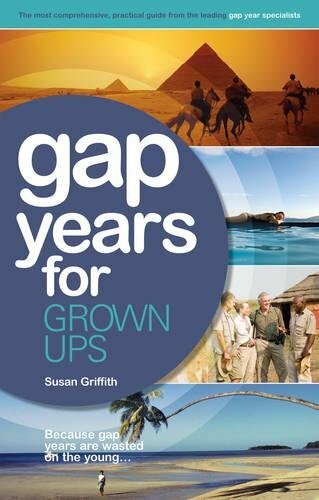 If you're thinking of taking a trip of a lifetime, be it with redundancy cheque in hand, career break, a much needed sabbatical, recent retirement or just grabbing life by the horns, Gap Years for Grown Ups is your essential guide to your time away. Covering everything you need to know for your trip of a lifetime Gap Years for Grown Ups will help you prepare for your year out, from taking the plunge with your employer and what to pack for your travels to the practicals of your time out there and reaping the benefits of a gap year on your return home. Get the most from your travels with all the essential information on the range of opportunities available to professionals and mature gappers. Find out about specialist gap year schemes for adult gappers, jobs and voluntary opportunities across the world for all abilities and time scales, as well as help on how to choose the right gap year programme for you, whether you want to learn a new skill, go on a retreat or improve your career while you are away. Gap Years for Grown Ups also takes you through funding your trip with advice and insight on all the finance essentials, from budgeting and bargains to paying the mortgage and renting out your home whilst you're away. This practical guide will help you get to grips with the essentials for living and working abroad; the permits, red tape and contact details you need as well as information on family travelling and getting the most from your experiences for both you and your children.